Proteins are important since they are the key to keeping our metabolism running efficiently, keeping our energy levels up, and maintaining blood sugar. It is also crucial for building muscle mass, balancing hormones, and so much more. This protein-packed almond smoothie is perfect for before and after workouts, or first thing in the morning. Add chopped apple, banana, avocado and almonds to the blender, along with 1 cup of water. Mix, slowly increasing speed, until well blended. In a bottle shaker, add protein power and left over 1 cup of water. Mix thoroughly and add to blender. Slowly increase speed until just blended. Don’t over blend as it will add unnecessary air to the smoothie. Optional is adding a few ice cubes to thicken the mixture. Enjoy immediately, it tastes like a vanilla milkshake! 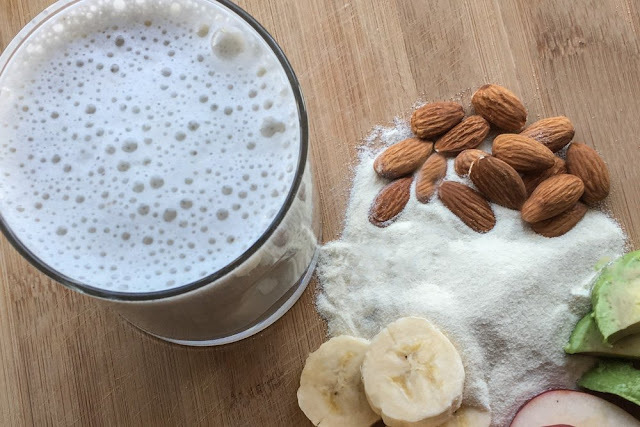 Benefits of ingredients in this protein-packed almond smoothie. They are an excellent source of natural sugars. Bananas have shown health benefits in the area of cancer prevention because of their high levels of antioxidants. They also help aid in digestion, promote healthy bones, lower blood pressure, and more. Almond butter is packed with protein, like many nut butter. According to the USDA, 1 tbsp of almond butter contains 3.35g of protein. Many bodybuilders and fitness models use nut butter as a source of protein and energy before workouts. It has a potent antioxidant called vanillin, which helps neutralize disease-causing free radicals. It also helps reduce chronic inflammation, which is considered a major risk factor for many serious diseases, including cancer. Avocados are packed with healthy fats, which contrary to popular belief, can actually help you lose weight. They are also rich in fiber, so they help you feel full for longer. They are a great source of vitamins and electrolytes than you can lose during a workout through sweating. They can also help you get hydrated. Apples are a great post workout snack. 1. “8 Health Benefits of Eating More Protein Foods.” Dr. Axe. Dr. Axe, 18 May 2015. Web. 16 July 2016.